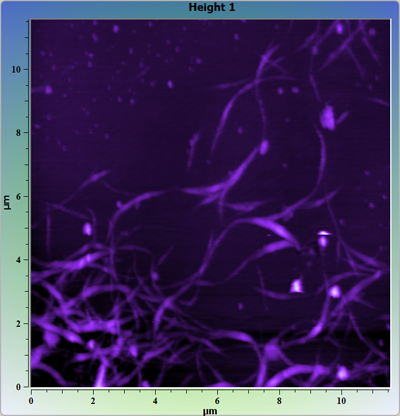 Carbon nanotubes (CNTs) on glass surface. 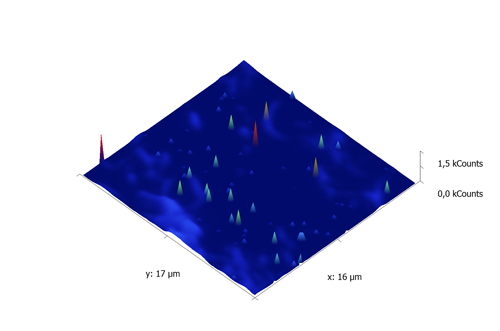 Carbon nanotubes (CNTs) on glass surface. Semicontact mode. 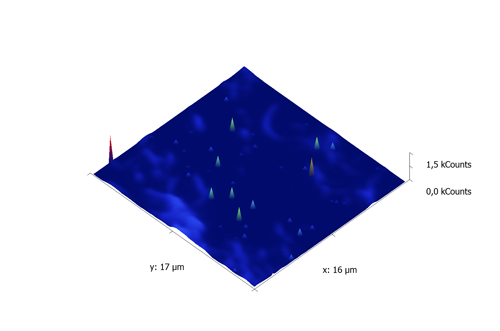 Images size 11,56х11,56 μm, 289х289 points. Left image - topography. Right image - phase. 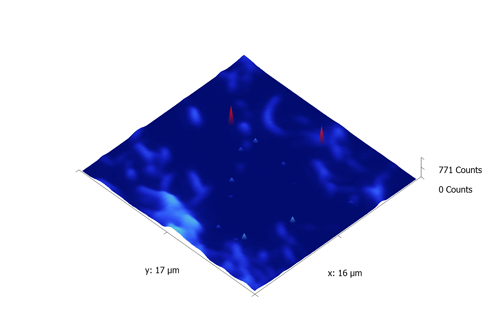 Images was obtained with AFM-Raman-Confocal system Centaur in atomic force microscope (AFM) mode. Images size 6,8х6,86 μm, 356х356 points. Grating 200 lin/mm, exposition time 40 sec, monochromator pinhole 20 μm. Grating 600 lin/mm, exposition time 10 sec, monochromator pinhole 20 μm. 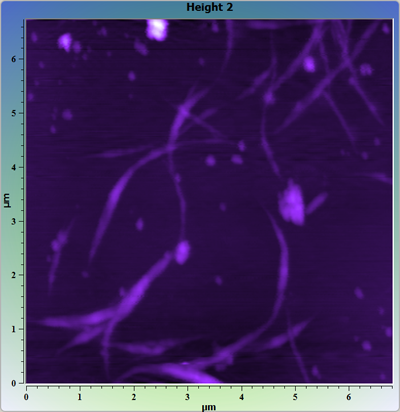 Carbon nanotubes (CNTs) on glass surface. 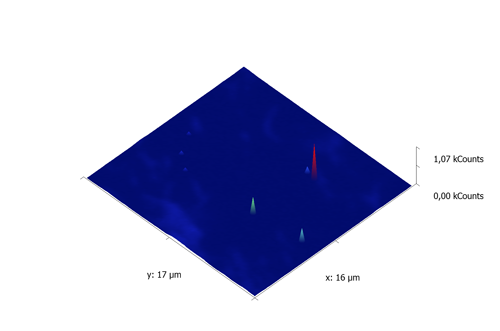 Confocal Raman image. One layer scanning. Image size 25х25 μm. 100х100 points. Exposition time at point - 0,05 sec. 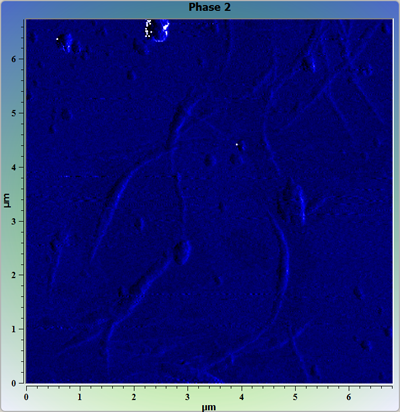 Images was obtained with AFM-Raman-Confocal system Centaur in confocal Raman microscope mode. Image size 15,7х16,7 μm. 100х100 points. Exposition time at point - 0,4 sec. 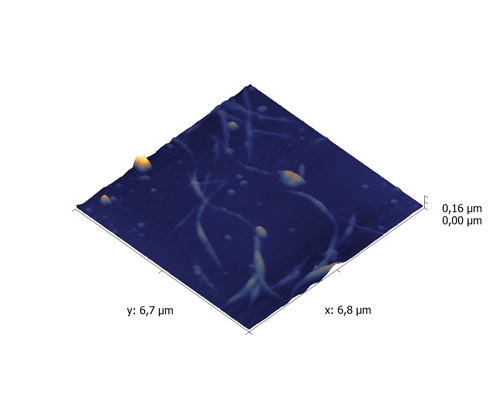 Left image - carbon nanotubes (CNTs) om glass surface. 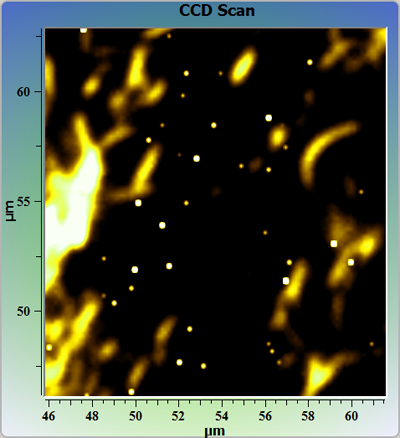 Confocal raman image. One layer scanning. Mapping of spectral maximum. 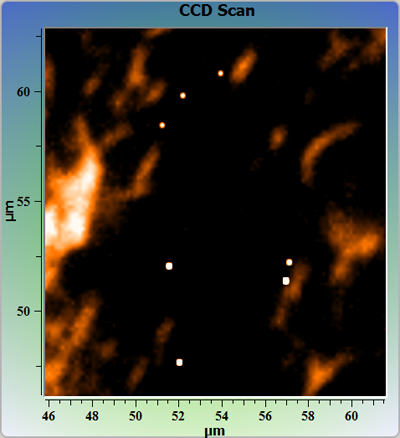 Image size 15,7х16,7 μm. 100х100 points. Exposition time at point - 0,4 sec. Spectral range 0-2800 cm-1. 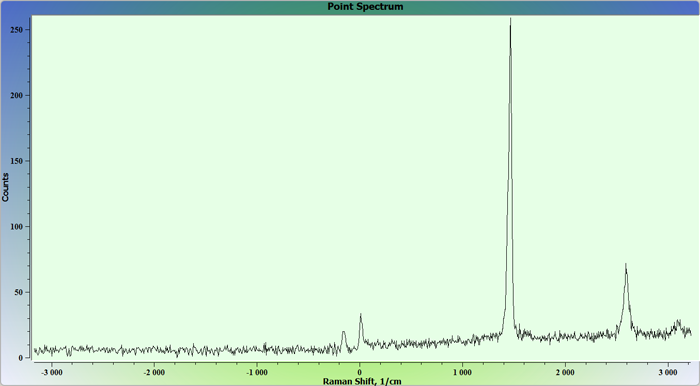 Right image - spectrum at point (red cross on left image). Lower right image - spectral maximum 3D image. 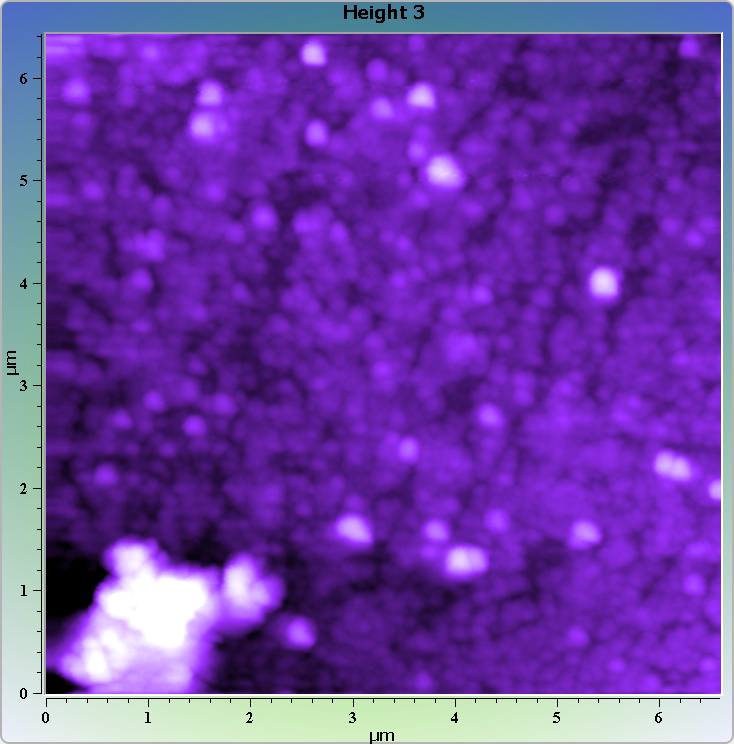 Image size 15,7х16,7 μm. 100х100 points. Exposition time at point - 0,4 sec. 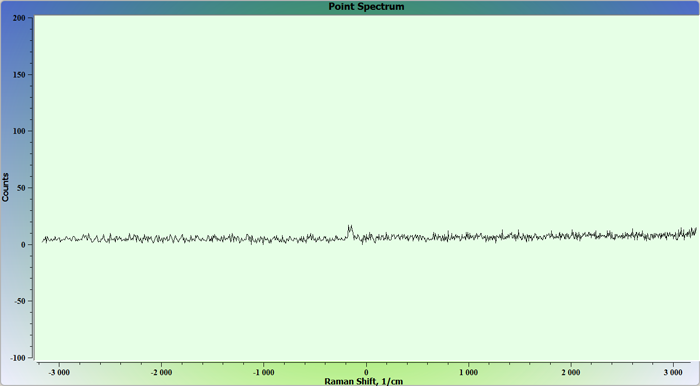 Spectral range 1340-2720 cm-1. Right image - spectral maximum 3D image. Image size 15,7х16,7 μm. 100х100 points. Exposition time at point - 0,4 sec. Spectral range 1340-1620 cm-1. Image size 15,7х16,7 μm. 100х100 points. Exposition time at point - 0,4 sec. Spectral range 2510-2720 cm-1. The sample was provided by Prof. V.K.Nevolin.